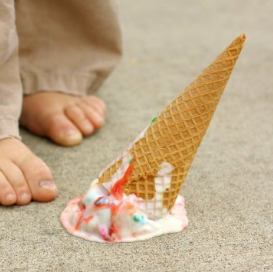 Studying the 5 second rule, antibiotic resistance genes in indoor dust and sewers, Legionella in the air, and water treatment. Bacterial cross-contamination from surfaces to food can contribute to foodborne disease. 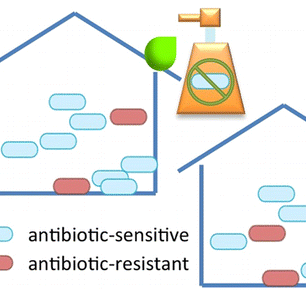 The cross-contamination rate of Enterobacter aerogenes was evaluated on household surfaces using scenarios that differed by surface type, food type, contact time (<1, 5, 30 and 300 s), and inoculum matrix (tryptic soy broth or peptone buffer). The surfaces used were stainless steel, tile, wood and carpet. The food types were watermelon, bread, bread with butter and gummy candy. (…) Contact time, food and surface type all had a highly significant effect on log % transfer of bacteria. (…) More bacteria transferred to watermelon relative to other foods, while fewer bacteria transferred to gummy candy. Transfer of bacteria to bread and bread with butter were similar, and transfer rates under a given set of condition were more variable compared with watermelon and gummy candy. (…) Here, we explore the relationship between antibiotic resistance genes and the antimicrobial chemicals triclosan, triclocarban, and methyl-, ethyl-, propyl-, and butylparaben in the dust microbiome. Dust samples from a mixed-use athletic and educational facility were subjected to microbial and chemical analyses using a combination of 16S rRNA amplicon sequencing, shotgun metagenome sequencing, and liquid chromatography tandem mass spectrometry. (…) . We observed six significant positive associations between the concentration of an antimicrobial chemical and the relative abundance of an antibiotic resistance gene, including one between the ubiquitous antimicrobial triclosan and erm(X), a 23S rRNA methyltransferase implicated in resistance to several antibiotics. 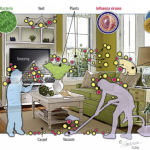 This study is the first to look for an association between antibiotic resistance genes and antimicrobial chemicals in dust. 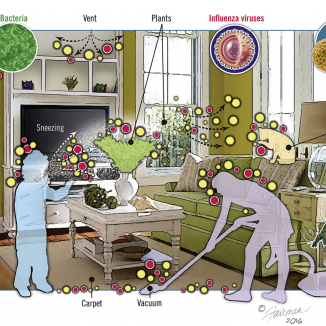 The modern built environment (BE) design creates unique ecological niches ideal for the survival and mutual interaction of microbial communities. 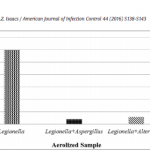 This investigation focused on the synergistic relations between Legionella and the fungal species commonly found in BEs and the impact of these synergistic relationships on the survival and transmission of Legionella. A field study was conducted to identify the types and concentrations of fungi in BEs. The fungal isolates purified from BEs were cocultured with Legionella to study their synergistic association. (…) The microscopic observations of Legionella internalization in fungal hyphae were confirmed by molecular analyses. 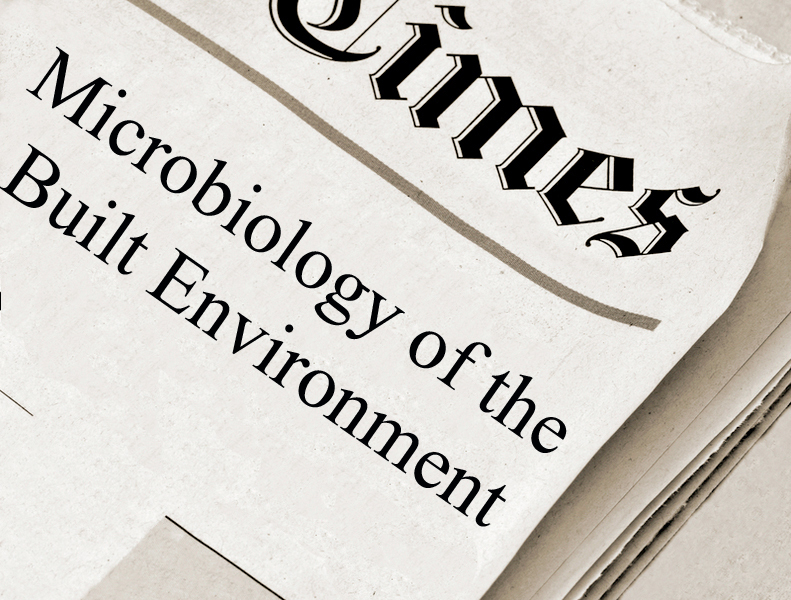 (…) This study provides the first evidence, to our knowledge, of Legionella cell presence inside fungi detected in an indoor environment. This symbiotic relationship with fungi results in longer survival of Legionella under ambient conditions and provides protection against UV rays. 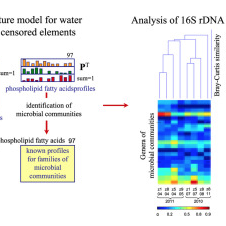 The aim of this work was to check whether a methodology based on the analysis of data that contain the entire phospholipid fatty acid, PLFA, compositions of water samples can be successfully used to interpret spatial and temporal changes in the microbial communities in water reservoirs. (…) A 16S rDNA analysis of some of the selected water samples in the monitoring campaign was performed in order to verify the results of the PLFA analysis. 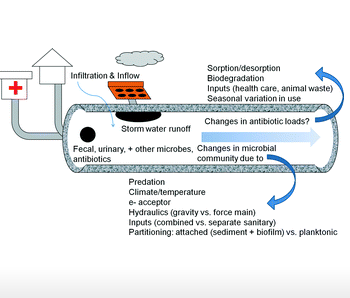 The results showed that the proposed methodology can be useful for a dynamic and sensitive evaluation of changes in the microbial quality of water before and after flash flooding and can help in taking a decision regarding further risk assessment. In developing countries, rural communities often face the lack of potable water infrastructure and must rely on untreated sources for drinking, which are often contaminated with waterborne pathogens. The use of home water treatment devices is seen as one means of reducing the risk of exposure to waterborne pathogens. 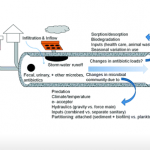 The aim of this study was to evaluate the microbiological and physicochemical performance of a simple in-home point-of-use device based on gravity ultrafiltration through an ultrafilter membrane.Twenty-five randomly selected households from 2 rural communities in CuliacÃ¡n, Mexico, were enrolled. 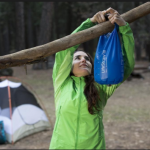 (…) This study demonstrated that point-of-use filters using gravity-fed ultrafilters are a low-cost, effective water treatment technology for water of poor microbial quality.